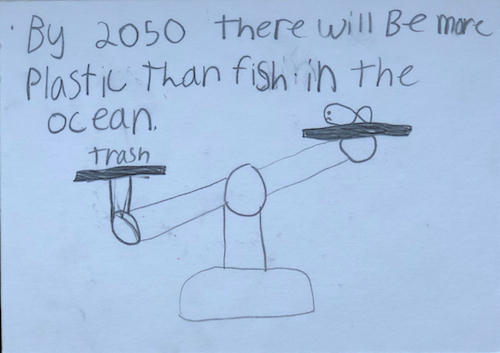 On January 22nd, five 5th grade students from the Sam Case Elementary Surfrider Club (aka: Oceanic Society of Turtle Lovers), along with leaders from the Newport Chapter and Oregon Surfrider staff, requested that the City of Newport, Oregon develop a sustainable shopping ordinance to reduce the amount of plastic bags used in the city and more importantly found in local waterways, nearby beaches, and in the ocean. This isn't the first time local Surfrider volunteers have pushed for a ban in Newport. Back in 2011, the Newport City Council voted 5-2 to implement a plastic bag ordinance but then reversed it a few weeks later. The ordinance was put on the ballot with only 38.77% voter turnout and was defeated by only 374 votes. The Oregon League of Conservation Voters weighed in on the side of the bag ordinance, saying, "We depend on our bay and natural resources for millions of dollars in local jobs, tourism, and commercial and recreational fishing - all these resources are threatened by plastic bags. We need to protect our local businesses and economy. Plastic bags deface our beautiful scenery - one of our most important assets - and can cause harm to wildlife, fisheries and the businesses that depend on them." 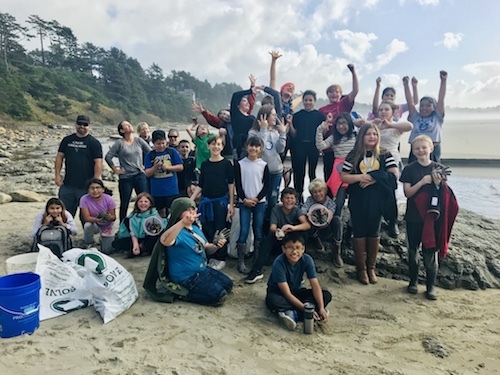 The Surfrider student club, led by teacher and club advisor Olivia Schroeder, formed in August of 2018 and has since partnered with the local chapter on beach cleanups, educational opportunities and now is at the forefront of pushing local platic reduction policies! The testimony given by these students was truly inspiring and laid out solid examples of other cities and countries that have banned single-use plastic shopping bags, which photodegrade and can end up in our food chain. The students asked the city councilors to do their part in protecting our ocean and coastal resources for them and future generations. 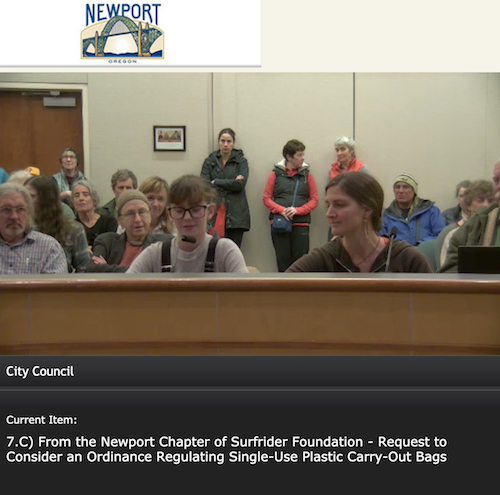 The testimony from these students and chapter leaders, in addition to expert information provided by Oregon Surfrider staff and public testimony that was overwhelmingly in favor of an ordinace, was effective in spurring action from Newport's City Council. The council voted 5-1 in favor of their staff drafting a Sustainable Shopping Ordinance that will help the city work toward their vision to “preserve, enjoy and live in harmony with our coastal environment,” as outlined in Newport’s 2040 Vision Plan. The staff was directed to work in consultation with Surfrider and base their work off our model ordinance developed with the Northwest Grocers Association. The draft ordinance should be ready by the February 4th council meeting where a public hearing on the draft will be held. If you live, work or play in Newport, Oregon, please contact the Mayor and City Council (via this online contact form) to tell them why you support a Sustainable Shopping Ordinance! The club plans to attend Surfrider's Rise Above Plastic Lobby Day this spring at the state capitol and encourage state lawmakers to pass legislation reducing single-use plastics in Oregon. This club x chapter partnership is a great example on how youth can be one of the most effective tools when encouraging policy change at both the local and state level. As of today, 15 cities in Oregon have passed plastic bag ordinances - Manzanita, Bay City, Wheeler, Salem, Bend, Corvallis, Eugene, Forest Grove, Hood River, McMinnville, Lake Oswego, Portland, Milwaukie, Silverton, and Ashland. Find out more about Surfrider's plastic pollution work at www.surfrider.org/initiatives/plastic-pollution!